Evelyn Mattheisen passed away on June 6, 2018, at Kalispell Regional Medical Center surrounded by her family. 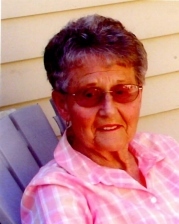 She was born on Aug. 20, 1922, to Val and Alice Zimmerman and grew up on the dairy farm in Creston. She married Griffin Mattheisen on Sept. 10, 1943. They spent their married life in Columbia Falls until moving to Kalispell in 1991. Mom returned to Columbia Falls following Dad’s death in 2004 and then moved to Buffalo Hill Terrace in December 2013. Mom was very active at Our Savior’s Lutheran Church in Columbia Falls, teaching Sunday School and, in later years, quilting every Wednesday. On Tuesdays she made quilts for the Church Women United at the Klothes Kloset. She also made many quilts and blankets for family and friends. She was most proud of the flannel baby blankets she made which became the ‘’favorite blankie” for many little ones. Mom was preceded in death by her parents, Val and Alice Zimmerman, her husband Griffin Mattheisen, and many friends and family members. She is survived by two daughters, Karen and Jim Flaherty of Kalispell, and Connie and Dan Jimmerson of Columbia Falls; two grandchildren, Skeeter and Jennifer Eckelberry of Rock Springs, Wyoming, and Jessica and Kyle Formhals of Columbia Falls. She is also survived by five great-grandchildren, Taylor, Brady, Haylee Jaylee Madison and Kaitlyn. She is also survived by one sister, Jean and Farley Grainger; and two brothers, Raymond Zimmerman, and Allen and Nancy Zimmerman. She also leaves behind many other friends and relatives. We would like to thank the special people at Buffalo Hill Terrace for the wonderful care and friendship they provided for Mom for the last four years. There will be a memorial service at 11 a.m. on Saturday, June 30, at Woodlawn Cemetery in Columbia Falls. A luncheon will follow at The Back Room.